Malta is an EU member state and also a member of Schengen Zone. As a citizen of Malta, you are also an EU citizen. That means you can freely move in the EU, and you may live and work in any EU country. Your valid Maltese second passport which is an EU passport gives you and your family freedom and extends your life. The country is a group of seven islands in the Mediterranean Sea. 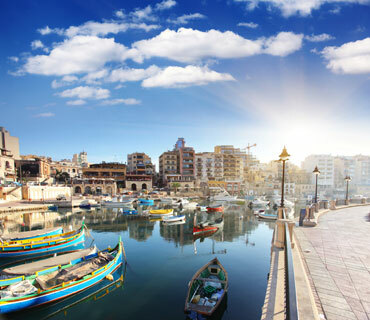 Malta is a melting pot of civilisations with a history stretching back thousands of years. Malta tax system is very favourable, and English is the second official language in the country. Malta has friendly relationships with Mediterranean rim countries and also with countries representing the major investment markets worldwide. Through the bilateral agreements between Malta and other countries, and through Malta's traditional economic links, the country has a high position as a business location and financial centre. Malta is at the top of international living indexes, mainly attributable to the Island’s quality of life, climate, value for money, safety and stability. You and your family will be EU citizens with the right to live, work, and study in any EU country. You are not required by Maltese law to renounce your existing citizenship. Malta has no restrictions on holding any dual nationality. You can enjoy visa-free travel to more than 160 countries across the World including US and UK. With your Malta passport you may stay 90 days in US. No municipal, inheritance, net worth, or wealth taxes. Double taxation treaties with almost 60 countries. Malta offers a high level of living, and the educational system is first rate, providing numerous private, international and public schools, institutes and a university of the highest standards. Malta has one of the lowest crime rates in Europe. Donation to the National Development and Social Fund: Main applicant - EUR 650,000, spouse and children below 18 years - EUR 25,000 each, further adult dependents - EUR 50,000 each. Investment into government bonds/shares: You are required to buy at least EUR 150,000 in bonds or shares in Malta, and you should keep it for five years. This ventures will need to be made in stocks sanctioned by the government as beneficial to the country. Property purchase or rental: You are required to buy a property of at least EUR 350,000 or enter a property rental contract for at least EUR 16,000, both on at least five-year contracts. Yes, the spouse of the main applicant, dependent and unmarried children under 25 years of age and dependent parents and grandparents above 55 years old can be included in one application. You and your family members should be healthy (not suffer from any contagious diseases) and all applicants must also be covered by an international health insurance policy, and have a clear criminal record. You will get your Maltese residency in a very short time and your second passport in a year.